Thanksgiving at the Simmons's house always revolves around an abundance of food, family and fun. But Justine's carefully planned menu gets upended when Rev decides to make a Crispy Deep Fried Turkey. Justine has been planning for months to cook her Juicy Oven Roasted Turkey with Quick Pan Gravy. With no one willing to back down, Rev and Justine decide to make their own birds and a friendly spousal competition begins. Justine prepares her Tangy Cranberry Sauce, Roasted Asparagus with Bacon and a Special Pumpkin Pie with Gingersnap Crust. 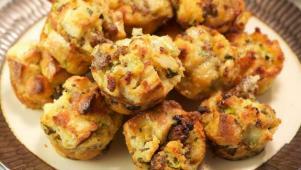 Meanwhile Rev throws down by making Mini Apple Pie Bites and Savory Individual Stuffing Muffin Cups. As the family gathers around the table, it becomes clear that no one can choose between the two amazing turkeys and all the delicious sides. Rev and Justine realize that at this Thanksgiving, surrounded by happy, healthy and well-fed family, they're all winners. 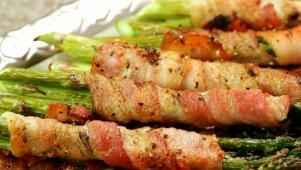 Justine's garlic and rosemary asparagus gets a flavorful bacon upgrade.